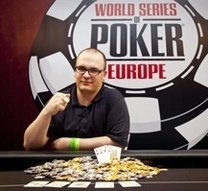 So far the 2011 World Series of Poker Europe has had a Swiss and an Australian champion. It now adds an American to the list as the third bracelet is set to travel all the way home to Las Vegas from the south of France. Steve Billirakis earned his second gold bracelet and €147,171 ($202,587) in the €5,000 pot-limit Omaha championship. Billirakis topped a 180-strong field including a tough final table featuring players from eight different nations such as Eoghan O’Dea, Sam Trickett, Ramzi Jelassi, Sam Chartier, and Jerome Bradpiece. The first player to hit the rail was this year’s WSOP main event finalist, Eoghan O’Dea. The young Irish pro’s father Donnacha won a bracelet in a pot-limit Omaha event in 1998. If Eoghan had of hung around long enough to take it down, he and his father would be the only father-son duo to win bracelets in the same game. Doyle and Todd Brunson are, to this day, the only father-son combo to win WSOP bracelets. Bradpiece raised to 15,000 in mid-position and Trickett made the call from the button. O’Dea came along for the ride and the flop was dealt A 7 6 . O’Dea bet 45,000, Bradpiece folded and Trickett bet the pot. O’Dea moved his remaining 75,000 in and the two turned over their cards. Trickett showed A Q 10 8 while O’Dea revealed A Q J 7 . The turn was dealt the J and the river was the 5 giving Trickett a flush and putting O’Dea out in ninth for €21,221. The chip leader going into the final was Englishman Sam Trickett. His tournament life was cut short by Italian Michele Di Lauro to put him out in fourth place for €77,642. After a raise of 48,000 and a call, Di Lauro and Trickett saw a 7 5 2 flop. The two then got it all in with Trickett the player at risk. Trickett held K 10 10 J while Di Lauro had Q 3 7 2 . The turn fell the A and the river was the 9 . Di Lauro’s two pair was enough to end Trickett’s dreams of a bracelet for now. He took €77,642 for a respectable fourth-place finish. Billirakis then went on to clean up, eliminating Jelassi before facing down Di Lauro for the final stage. The American took his last opponent down when he called Di Lauro’s all-in on a flop of A K 7 . Billirakis held A K Q 3 , which held to make him the third champion of this year’s Series. Di Lauro received €147,171 for second place. Billirakis won his first WSOP bracelet in 2007 in a $5,000 mixed hold’em event. At the time he was the youngest player to ever win a bracelet but that didn’t last long as Annette Obrestad soon took over when she won the inaugural WSOP Europe main event on the eve of her 19th birthday. Elsewhere at the WSOPE, 10 players from 258 remain in the €3,200 no-limit hold’em shootout including James Dempsey, Richard Toth Taylor Paur, Steve O’Dwyer, Bertrand Grospellier, Tristan Wade, and Max Silver. They compete today for the €182,048 top prize. This is taking place alongside the earlier stages of the €10,400 no-limit hold’em split format. The four-day event started off ninehanded, changed to sixhanded for its second day, and will change again to heads up for days three and four. Out of 125, 80 now remain and some of those up the top half of the chip counts are Michael Mizrachi, Tom Dwan, Freddy Deeb, Kent Lundmark, Peter Jetten, Joel Nordkvist, Brian Hastings, Jason Mercier and Matthew Waxman. Tags: Poker Tournaments, World Series Of Poker Europe, Cannes, Las Vegas, Live Poker, WSOP, Main Event, Steve Billirakis, Sam Trickett, Eoghan O'Dea, Max Silver, Tom Dwan, Bracelets.